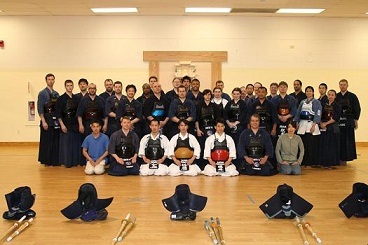 On April 25 and 26, 2009 the Northern Virginia Budokai Kendo club hosted 4 sensei of the Niten Ichi Ryu Musashi-Kai of Japan. The Musashi-kai is a non-profit Japanese organization that seeks to standardize and promote nito-ryu kendo. The head sensei of the Musashi-kai, Nakamura Tenshin, is the 17th soke of one line of Niten Ichi Ryu koryu budo. The Musashi-kai attempt to implement the principles of this koryu in modern kendo, while operating strictly within All Japan Kendo Federation rules and guidelines. This is the second seminar of its kind, the first being held in 2008 at Salt Lake City, Utah. Four sensei came from Japan to teach this seminar. They were: Ryoichi Fujii, kyoshi 7-dan; Futoshi Sato, renshi 6-dan; Kazuhiko Kashima; 4-dan, Norikazu Matsumoto, 4-dan. There were approximately 33 attendees. They came from such distant locales as England, Puerto Rico, California, Utah, and New York. In addition, every major AUSKF kendo dojo of the metropolitan DC area was represented, including 4 SEUSKF dojos and 2 GNEUSKF dojos. The following is a concise description of the seminar topics, and brief explanation of the major points taught by the sensei. NoVA Budokai intends to make a comprehensive video of the seminar available to the public as soon as possible. In the meantime, please direct any questions regarding the seminar to Brian Sherry, NoVA Budokai, blackknight@gmail.com. We started the seminar with Niten-Ichi ryu kata. The first lessons were Kamae and foot position. The basic nito-ryu kamae is called joge-tachi (up-down sword position) and involves the positioning of the daito at a diagonal line across the forehead in a position similar to jodan, with the shoto pointed out in front at the opponent's throat, like in chudan. Footwork is like regular kendo, using suri-ashi whenever possible. In nito kendo, you can hold the daito in the right hand, called sei-nito, or left hand, called gyaku nito. You can also position your feet with either foot in front. You can also hold the daito and shoto anywhere you prefer on tsuka. In these respects, nito is very flexible. Regarding footwork and body position, the sensei discussed "Namba Aruki", the style of walking that is basic to nito ryu. Namba Aruki is an old-fashioned way of walking in Japan, using the same side arm and leg simultaneously. It is like a kabuki actor's walk. This is relevant to nito in that you must keep your hips square when you strike. For example, when striking men from sei-nito, there is a tendency to turn your hips to extend your shoulder. Instead, you should turn your left hip forward in conjunction with your right arm in order to keep the hips square as you strike. Sato sensei said that, in nito kendo, the saying is "ichi-dan, ni-sho, san-dai." That is, first is tanden or center, second is shoto (short sword), third is daito (long sword). Tanden is the basis of all movement in nito. You must move from your center and keep your hips as square as possible to avoid creating suki (openings). Your shoto is next, and the short sword should create your seme (pressure) on your opponent and be used to set up your attacks in one way or another. Finally your daito comes last. Striking the opponent is last because you should always win with your seme before you strike. This is very similar to what we learn in itto kendo, but the sequence of importance is a little different. Perhaps the most important point for striking properly from joge-tachi and with nito in general is to observe the principle of chushin, or the axis of the shinai. In itto, the axis is located at the base of the tsuka. The sword rotates on that axis. In nito, however, the axis of the daito is above the tsuba. In striking men with nito, from joge-tachi, one should lower the sword toward the opponent's mune and then straighten it out to strike the men. One should not swing the daito over the shoulder or to the side of the body. This important element of nito kendo is better explained in person and/or visually. We then moved on to nito kata practice. We learned how to hold the two nito bokken and to draw them, as well as nito kata reiho (manners) which are a little bit different from standard kendo no kata reiho. All nito kata are done in sei-nito. We practiced katas 1, 2, 10, 11, and 9 from the niten ichi ryu kata. Each kata is itto vs. nito. #10 and #11 are basic strikes using the shoto to suppress the opponent's sword and strike men and kote, respectively. Striking kote from sei-nito is interesting. The blade and the arm form a shape similar to the Japanese hiragana "ku", much like the sideways v-shape of the letter K. So the kote strike of the daito is diagonal across the kote and parallel to the rightward block of the shoto. This is perhaps more easily shown than described. #9 is a shoto kata. It is actually a direct example of what is a proper scoring technique with the shoto according to the All Japan Kendo Federation. Specifically, a shoto strike can count as a point if made with full spirit and big motion while the nito player's daito suppresses the itto player's shinai. In this kata, uchidachi tries to strike doh, and shiidachi uses the daito to block the attack while delivering a proper strike to the men with the shoto. Kata #1 and #2 were oji-waza. # 1 is men-kaeshi doh and #2 is kote-nuki-men. We practiced these kata for about and hour and a half while focusing on our kamae and footwork, as well as chushin. In the afternoon we put on our Bogu and went to work. We practiced drawing the swords and putting them away while in bogu. 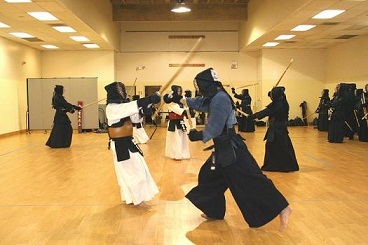 As described in the Rules of Kendo Shimpan and Shiai, the sword which will be held in the left hand is drawn first, passed to the left hand, and then the sword held in the right hand is drawn second. The reverse is true for osame-to, where the sword in the right hand is first put away and then the sword in the left hand. At no time should a nito sword be pinned under the arm during osame-to. Instead it should be held by a hand at all times. The sensei provided Velcro "shoto holders" for all participants so that they could perform as an itto motodachi. We then proceeded to apply and practice the lessons of niten ichi ryu kata in bogu. We practiced basic men, kote, doh, and tsuki. As in the kata, we practiced men-kaeshi-doh, kote nuki-men, and tsuki-osae-te men. We used a rotating three lines formation to practice with each other while the sensei demonstrated techniques and then watched us perform and gave us corrections. When performing kihon waza, it is very important to always use the shoto to protect an opening. For example, when striking men in nito, one should use the shoto to cover the opposite side doh. One should not leave the shoto hanging uselessly in the air. Shoto strikes should be large and powerful. The Musashi-kai teaches striking with the shoto without bending the wrist. The wrist should remain straight and the arm and elbow moved in a large cutting motion. In nito, kihon doh strikes are made to the datotsu-bui on the same side. For example, the kihon sei-nito (right hand) doh target is the opponent's left side doh, or gyaku-doh. The sensei emphasized that, in nito, you must try to use the two swords together as much as possible. For example, when practicing men-kaeshi-doh, one should try to strike the aite's shinai with one's shoto at the same instant one hits the aite's doh. This principle is always in effect, whether performing kihon shikake waza or oji-waza. We finished the day by making four lines and performing a very enjoyable jigeiko with the sensei. First thing Sunday morning we reviewed the basic kihon techniques in bogu practiced on the previous day. We then moved on to nito kirikaesi and nito uchikomi. Nito kirikaeshi consists of one set with the daito and one with the shoto. The shinai not being used should always b protecting the opposite doh. In addition, the shoto set is performed, after the initial men strike, using ayumi-ashi (walking step). Finally, the last men is struck with the daito, using a reverse-foot technique. In other words, if you normally strike with the right foot forward, you assume a left foot forward stance and bring your right foot all the way forward to strike the final men. Nito uchikomi consisted of striking men-doh-kote-tsuki. At this time the sensei took a few moments to discuss zanshin in nito. The sensei said that, of course kihon zanshin involves passing by your opponent and turning to face them. However, this is often not possible, especially in shiai. In that case, the sensei demonstrated nito zanshin whereby they struck the target with strong forward motion, but moved diagonally after the strike and resumed nito chudan facing the opponent. This was done without passing the opponent. This appears to be a difference from nito to itto, whereby one does not need to make taiatari or pass in order to show proper zanshin. The sensei rarely made tai-atari after a strike during demonstrations or keiko while using nito. However, in response to a question on that, the sensei stated that tai-atari also constitutes proper nito zanshin after a strike. The most important point for zanshin, they emphasized, was to display a strong posture and energy regardless of the final position of the nito player relative to the opponent. The sensei then covered the subject of fighting alternate kamae from nito. First, the sensei discussed jodan kamae. The sensei stated that most chudan players feel that their men is threatened by the raised daito of the nito player. This can provoke the itto player to take jodan in response. However the sensei said that a nito player should welcome the opportunity to fence against jodan. The reason for this is that the jodan player's kote become even easier to hit for the nito player as opposed to an opponent in chudan. Also, whereas a nito player has the shoto to protect any openings after a strike, the jodan player has no such "safety net" and is very exposed after striking. Accordingly, the sensei believe that a nito player is generally at an advantage, assuming equal skill, when facing jodan. The sensei then demonstrated techniques for fighting kasumi-no-kamae and hira-seigan-no- kamae. These kamae are unusual in kendo but often deployed by chudan players facing nito. The sensei demonstrated that kasumi-no-kamae (crossing right hand over left, and raising and pointing the shinai to the left) has the potential to really befuddle a nito player. It hides many targets yet still presents the opportunity for the kasumi player to strike the nito player. The sensei advised nito players to look for kote openings from the kasumi player, and also doh. The sensei noted that the current FIK rule is that the left kote of a player who is not in chudan is a valid datotsu-bui. Therefore, the kasumi player's left kote may be exposed. The same is true for hira-seigan where the shinai is pointed in a flat trajectory toward the chudan player's right side. Even if such kote attacks are not awarded ippon by the shimpan, they may disconcert the itto player enough to create other openings, such as men. The sensei then addressed the subject of fighting nito with itto. Primarily, the itto player must realize that a nito player's suki are protected as long as the nito player does not move. It may be possible to hit doh or kote, but in general a nito player in the proper joge-tachi kamae is very well protected. Therefore, the key is to attempt to break the nito kamae in order to create a suki for ippon. This involves slapping away the nito shinai, attacking from multiple angles, and launching multiple attacks as often as possible. 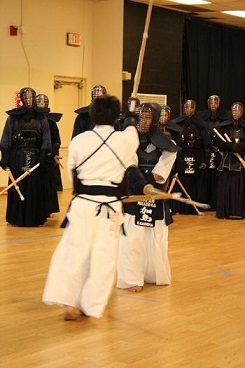 All these techniques can cause the nito player to move, attempt a counterattack, or otherwise compromise their kamae. Once an opening appears, it must be struck quickly. Therefore, a high tempo of attack and sharp control of the itto player's kensen is key to defeating a nito player. 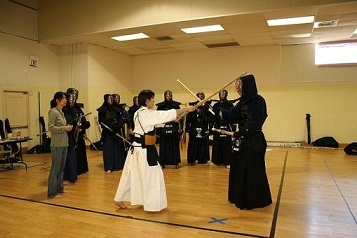 The attendees then resumed a three-lines formation, and practiced attacking opponents in the alternate kamae of jodan, kasumi and hira-seigan. After lunch, we had jigeiko of participants, in 2 alternating lines doing itto and nito. The frontline were mudansha and 1-dan players, the rear 2-dan and above. Each line performed jigeiko in both nito and itto, then rotated and switched from the front to the back. In this manner we were able to complete several rounds of jigeiko under the supervision of the sensei. After jigeiko, the participants were split up into 3 groups of 10-11. Each group was assigned to a shiai-jo and one sensei was shimpan for each group. Each group then had practice shiai matches against the other group members. Each participant fought one match in itto and one in nito. The sensei frequently paused the action to provide corrections to form and tips on technique and opportunity of attack. This was an excellent opportunity to receive personalized instruction and comments from the sensei for each participant. After each court was finished, the sensei gave us a short break. When we came back, the sensei announced that the final event of the day would be a large team match, splitting the class into two teams of 15. Students were arranged on each side from low ranking to high. Each participant performed shiai with 3 of the sensei as shimpan. Each pair of competitors performed 2 ippon-shobu matches, one each in itto and nito. Any ties were decided by hantei of the shimpan. For the final match of the taisho, instead of hantei there was also a sudden death 3rd ippon-shobu match. After the matches, the sensei commented that they were quite pleased with the progress of the attendees over the short period they had to learn the basics of nito. The sensei again emphasized that nito practitioners must focus on chushin and keeping the hips square in order to strike properly. The sensei then presented awards to students who showed good progress, strong spirit, and who contributed to the success for the seminar. Students received tenugui and sets of niten-ichi-ryu bokken as awards. The sensei received gifts from the host dojo and both the sensei and the hosts of the seminar spoke final words of encouragement and thanks. Finally, the sensei demonstrated nito "home study" practice exercises which students could use at home or in a dojo where there were no other nito participants. This concluded the formal nito seminar. This seminar was very educational and a rare opportunity. Over 30 students from around the country and abroad came to take advantage of this opportunity to train with the sensei from Japan. The two-day format allowed for both an introduction to nito-ryu kendo and the practice of advanced techniques, providing something for the complete neophyte and the (somewhat) experienced practitioner of nito. The sensei spared no effort in trying to convey as much information and advice in the short time they were given. The participants were highly enthusiastic about the training they received and many expressed an interest in continuing nito kendo. In addition, senior students learned more about proper nito-ryu technique and should now be in a better position to judge nito-ryu kendo at local shiai. Finally, the sensei demonstrated techniques both for and against nito, providing something for everyone's practice, whether they pursue nito themselves or confront a nito player on the shiai-jo at a tournament. As a result of this successful seminar, the NoVA Budokai kendo club intends to form a nito-ryu study group. This group shall meet approximately once a month to practice the lessons learned at this seminar. It will be open to all students of kendo regardless of federation affiliation. The Musashi-Kai are very supportive of this idea. This development presents a chance to strengthen understanding of nito-ryu in the US and to support those kendo students who are interested in studying nito-ryu. In the future, the Musashi-Kai hope to return to the USA for more seminars and to continue to promote the growth of nito-ryu kendo. It is likely that a third Musashi-kai nito-ryu seminar will be held in the Western USA during 2010. 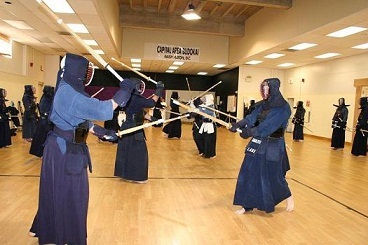 For more information on studying kendo, please contact Patrick Stewart at kendo@capitalareabudokai.org.